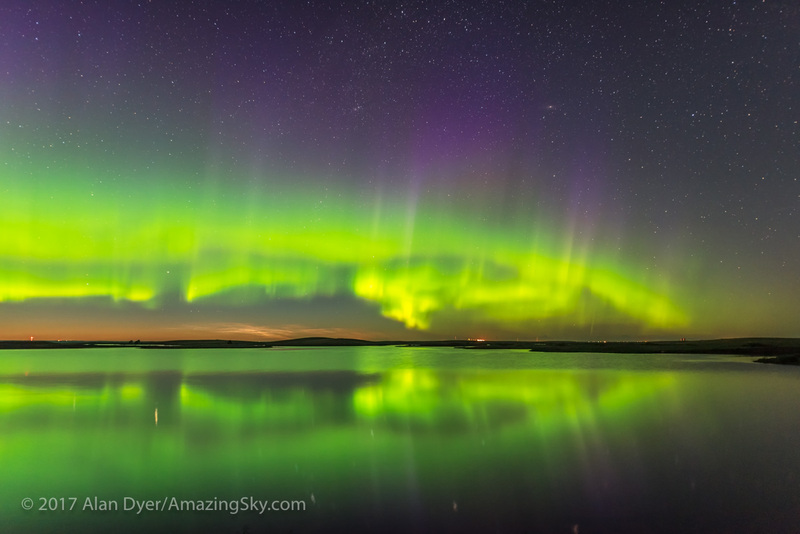 The Northern Lights dance in the solstice sky over a prairie lake. This was a surprise display. Forecasts called for a chance of Lights on Saturday, June 24, but I wasn’t expecting much. Nevertheless, I headed to a nearby lake (Crawling Lake) to shoot north over the water, not of the Lights, but of noctilucent clouds, a phenomenon unique to the summer solstice sky and our latitudes here on the Canadian prairies. But as the night darkened (quite late at solstice time) the aurora began to appear in the deepening twilight. I started shooting and kept shooting over the next four hours. 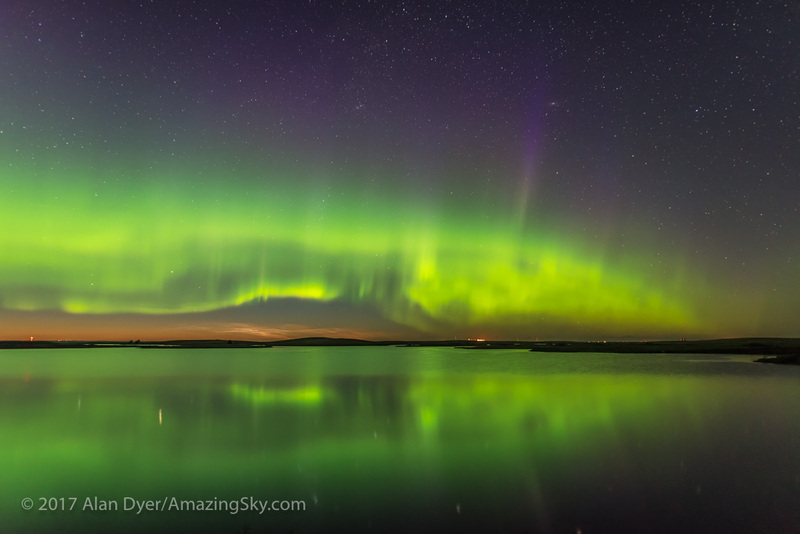 I took a break from the time-lapses to shoot some panoramas, such as the headline image at top, capturing the sweep of the auroral oval over the lake waters. Just on the horizon you can see some noctilucent clouds (NLCs) as well – clouds so high they are lit by the Sun all night long. NLCs sit at the same height as the bottom of the auroral curtains. But they appear here lower and much farther away, which they likely were, sitting farther north than the auroral band. A 360° panorama of the aurora and Milky Way in the twilight sky of a summer solstice evening. I also shot this 360° panorama (above) capturing the arc of the aurora and of the Milky Way. This is a stitch of 8 segments with a 14mm lens mounted in portrait mode. I’ve assembled the several time-lapse sequences I shot into a short music video. Check it out on Vimeo here. Click through to the Vimeo page for more technical information on the video sequences. As always click HD, and relax and enjoy the dancing lights over the calm waters of a prairie lake on a summer evening. I enjoy your “magnificent obsession” the art of photography of the sky and your vast knowledge base there of. You are incredibly talented and gifted. Am looking at the Northern Lights over a Prairie Lake photo you sent, and reflecting. I would have missed this rare event in nature if not for you. 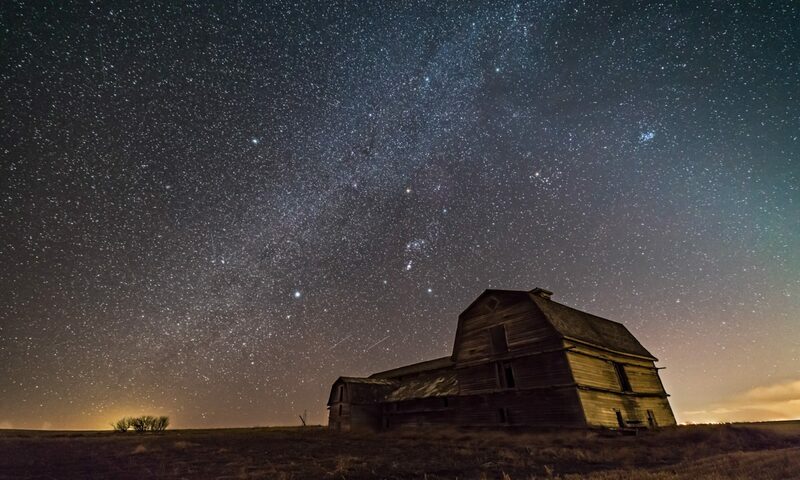 Thank you for capturing the moment and for sharing this incredible scene in the Amazing Sky. Again thank you for sharing moments in a world we would otherwise have missed completely. Your work makes the world a better place to live and you are so appreciated. Thanks! I used to work in Waukesha, but lived between Eagle and Mukwonago. Spent a lot of afternoons hiking in Kettle Moraine parks.